Documentary by Oliver Dickinson. French movie. 1:28. As early as 1850, the Grammont law punished ill-treatment to our wordless companions. But, to this day, the landscape of the French breeding has mainly taken the form of pigsty-factories, overpopulated stabulations, robotic industrial farms ... Fortunately, Laure, Nicolas, Annabelle and their fellow breeders choose another way to to offer a more dignified existence to their animals from beginning to end. And their efforts are rewarded by the bond they weave with their animals. A link that lifts us all ... 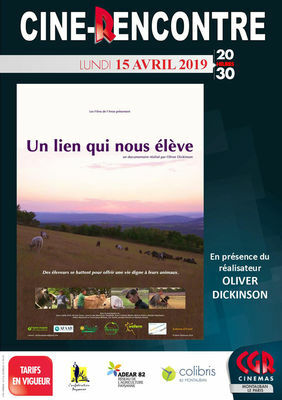 Screening of the documentary "A link that lifts us", followed by a debate in the presence of the director Oliver Dickinson and with the participation of the Confédération paysanne 82, ADEAR 82 and Hummingbirds 82 .